A lot of people assume that the “self-serve” boost-a-post function you find on your Page Timeline, or the little box on the sidebar, is what Facebook advertising is all about. They’re usually disappointed to put it mildly. I certainly was. That was until someone said: “Have you taken a look at the Ads Manager and Power Editor? That changes everything.” And they were right and because you don’t know what you don’t know, here’s a list of five things you may not know about Facebook advertising. Perhaps this knowledge will change your perspective too. You can upload your mailing list (or telephone numbers) of current clients or prospects, and if Facebook can find a match for your contacts, you can target these people with your advertising. Some might ask why you would want to pay Facebook to reach people you already have the contact details for, and are perhaps already reaching through email marketing. The answer is that unless you are giving away free tickets to an Elvis concert, it usually takes more than one communication attempt to get noticed; the usual estimate is in fact about five “impressions”. By mixing your email marketing up with a bit of Facebook advertising, you are less likely to come across as harassing your prospects, and you may even get noticed by those prospects who don’t pay much attention to their emails. How good is that? You may have already noticed this happening yourself when you visit a website and then adverts from that same website seem to follow you around wherever else you go on the web. This is called remarking, or retargeting and, as above, increases the number impressions (or reminders) a prospect will get about your product. To do this, Facebook gives you a bit of code to put on your website and then Facebook tracks your website visitors when they arrive on Facebook. That’s what those cookies are all about. 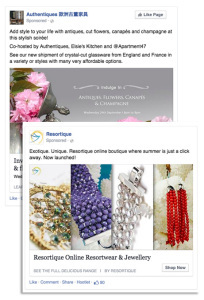 By using URLs of pages on your website as filters, Facebook remarketing can be very specific, and you can specify particular pages people have or have not visited. If someone visited your checkout page, but didn’t end up at the thank you for purchasing page you can assume they abandoned their shopping cart, and write your advertising copy accordingly. This is very powerful. These audiences are generated by Facebook based on the demographics, activity and interests of audiences you have already set up in Facebook (see above), or who look like you current Facebook fans. “Lookalike” audiences are a powerful way to extend your reach on Facebook, particularly if you original audience is very specific and homogeneous. This feature allows you to reach people with very specific interests, which is very helpful if you have a product or service that is only of any real interest to people who are, say, only interested in Elvis. How else would you reach them? However, you should choose your interests very carefully because some big brands have a lot of spammy “interested” followers because they run open-to-all competitions or promotions that everyone and their mother enters. Look for niche brands or names that your target marketing might be interested in, and hope that the niche company has not also run a mass campaign. By split testing adverts using different artwork or different headlines, or testing the same advert against different audiences you can learn a lot. Facebook’s Ads Manager allows you to organise your campaigns and track the results, then you can fine tune your campaign and get even better results. And the best thing is that as your campaigns get more effective, Facebook charges you less per click. It does make sense. Facebook doesn’t want to waste its valuable platform showing adverts that no one wants to see or act upon, but if your advert gets a good response, usually indicated by a good click through rate (CTR), then Facebook gets more money, and it keeps its customers happier, so you get a little reward! and on Facebook you can measure a lot. 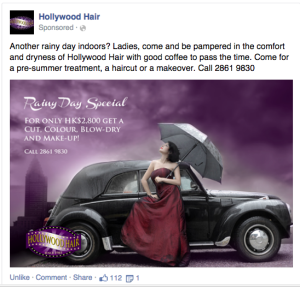 These five points are just the beginning of what is good about Facebook advertising. I do feel I have to make a stand on behalf of Facebook. When you consider the options, Facebook is very powerful and in fact, when done well, very economical. However, like any marketing tactic, it is best done as part of a sales funnel strategy that leads to email address collection and a nurturing cycle to generate sales. We offer Facebook Advertising workshops designed for small business owners. If you are interested, please email us to learn when the next workshop is scheduled. If you liked this article why not sign up to get the next one delivered directly to your inbox? shares. You can share and leave your comment below. Katie McGregor has worked in the communications industry for over 25 years as both a customer, and a supplier of marketing and communications services. She was an early adopter of email marketing, and now enjoys the power that digital marketing brings to marketing.